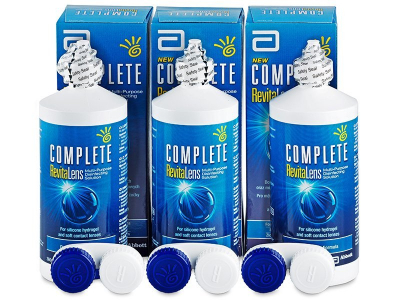 Complete RevitaLens solution gently and effectively cleans and moisturises lenses. Save money with our special pack of three 360 ml bottles. Each bottle comes with an antibacterial lens case. New COMPLETE RevitaLens Multi-Purpose Disinfecting Solution is a full-fledged replacement for the old COMPLETE Solution. COMPLETE RevitaLens Multi-Purpose Solution disinfects and moisturises contact lenses and is suitable for all types of soft contact lenses, including silicone hydrogels. It takes care of your eyes by maintaining a stable tear film, which is important for comfortable contact lens wear. The package also contains three contact lens cases. We also offer this solution in different sized packages of 360 ml and 2x360 ml.